We all love coffee. And why not? The aroma, the flavor, the way it runs down the throat, everything makes you die for it. By the popular statistics revealed by the USA today, it has been revealed that about 83% of the adult Americans drink coffee. No wonder Starbucks is such a popular coffee store in America. Gone are those days when we used to make coffee at home manually and used to enjoy some awesome coffee in the coffee stores. Now, we can make the perfect coffee at our home. Coffee machines are there for us, the coffee-lovers, to make a perfect cup of hot brewing coffee to tantalize our taste buds and make ourselves more energetic. But which coffee maker should you buy? If you are in love with coffee, you would have to get a coffee maker. But if you like to have an espresso, you would again have to get hold of an espresso maker. Then what happens when you love both of these types? Do you have to buy both the devices? Not. This is where Nespresso Vertuoline steps in. It is one unit serve coffee maker that can be used to make both espressos and normal coffee. We bet you have already known of the Nespresso brand for ages, but this time, they have launched something so unique, amazing and multifunctional which is being loved by coffee lovers worldwide. Now let us do an in-depth review of the Nespresso Vertuoline. What we liked about Nespresso Vertuoline? This device is a very modern and sleek design, and it will look amazing on your countertop as well. It is a one unit serving machine which can brew a single cup of coffee at once. Therefore instead of making a big pot of coffee that you don’t need, you can stick to the amount of making either one of the two coffee types. It comprises of a very simple design, and there is a compartment for placing the coffee pods and a button starting the brewing. The best part about the design is that it is tried and tested with various blends of coffee without being apprehensive about the chance that you will hate it and end of wasting the entire pot. It also has a detachable water tank that is very easy to operate for emptying, filling and cleaning. Among these, some models also are accompanied by a milk frother, which is used along with the device. The original settings on this device are 1.35 ounces for espresso and 7.77 ounces of coffee. But you it is adjustable on a scale of 0.3 to 17.0 oz. The range can vary on your caffeine needs, and you can adjust the scale for all the three pouring sizes. Medium size for the regular coffee cups. Large size for oversized thermoses. Now you do not have to think about dripping coffee all over the table just because your pot is not fitting under the machine. You can still have an accurate amount of coffee that you require. The best part about Nespresso Vertuoline – it does not take the entire day to brew your morning coffee Brew. It is one of the best devices that can get the preheating done in about 20 secs, and if you are late for work and you still want to have a pot of coffee, this device will serve the purpose perfectly. If you are apprehensive about whether or not It will be able to brew the coffee taste that you are looking for, you are in luck. This is because it is incredibly user friendly, and it has a one button operating system. This means you do not have to ponder over complicated menus and handling an entire control panel. All you have to do is to insert the pod, close it, and let the centrifusion do the job. Centrifusion is one such technology which this device uses in their coffee making process. It is an impressive system in which once the button is pressed; the machine starts rotating at a speed of 7000 RPM so that your coffee is blended to perfection. If you tell the device to produce cream, it will also do so. To sum up, it is indeed an amazing technological layer for an innovative only coffee producer. If you have been thinking that with all these techniques and high edge functions, the machine size is going to be magnanimous, you are wrong. You might be surprised to see that the machine that measures only 11.9*8.3*11.9”, will be only about 10 pounds and will not take up much space of your tabletop. It is very easy to keep wherever the reason available room, and even switching places is easy because it does not have much weight. Spot the color it is available in three distinct colours, so you can buy any one of these which suits the decor of your kitchen. It has a unique way of producing the product, and therefore it is not compatible with K cups or ground coffee. It can produce hot water for any other drink that you might need, and you can adjust the cup settings which makes it entirely flexible. Also, there is a wide range of accessories that match it. Everyone has agreed that regarding pure flavor this coffee maker is unmatched. The flavor is decent, and its fast-paced working mechanism makes it flawless in every aspect. All you have to do used to measure the quantity and press the handle. It has a single button operating system, so then you say never have to worry about anything else except for enjoying the coffee or espresso. When you purchase the Aeroccino along with it, it helps in transforming your home or office to an expensive coffee shop complete with lattes and cappuccinos. If you want to get over the grinding on hand system, then this is the right kind of machine for you. 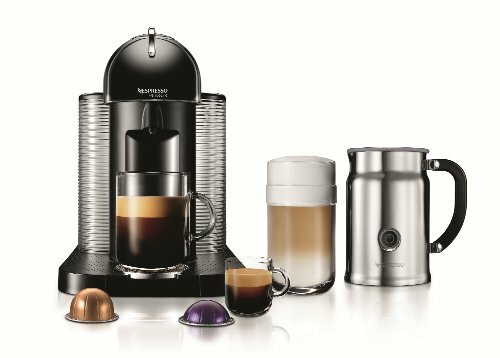 Some of the models of Nespresso Vertuoline is accompanied by their milk frother which can give your coffee or espresso the rich flavor that you have always desired. It gives an absolute smooth texture to the coffee, and it can be created hotly or coldly so you can never run out of options when you are personalizing your drink. When it’s about cleaning up this device is an amazing one because here the pod will automatically get out itself right after the brew has been finished, and the machine unit has a capacity of holding about 12 pods, before the need to be cleaned. Therefore, you do not need to maintain or clean up this device time and again everyday. When you get the product, you will see that it comprises of a coffee maker a milk frother 12th pods, instruction booklet, and an information folder. Also, if you have any queries, you can always go for the customer support system which is efficient and is available round the clock. What we didn’t like about Nespresso Vertuoline? The first downside to this device is that it is expensive and the retail prices somewhere between $150 to $200 and it varies with the kind of store you are buying it from. Therefore, you should take care that Nespresso isn’t the product which you would like to buy whimsically. At first, you need to research that it is just the kind of a device that you’re looking for before burning a hole in your pocket while buying it. You also have to remember to get new coffee pods for replenishing your machine the moment you are out of it. Yes, it is similar to buying pods for any other coffee maker, yet the price is something that you need to remember. Especially if you are an avid lover of Multipacks of flavor, then it will cost you $50. It only recognizes Nespresso brand coffee pods. This means that you would not be able to make it compatible with any other coffee or Espresso pods manufactured by the other companies. Even if you are Force full with the machine and you insert an incompatible pod, you will be able to mark the difference because the coffee won’t grow correctly and it would taste disgusting. This is because Nespresso Vertuoline is here with the technology that can read the barcodes placed on the Nespresso only pods. It is definitely a great and unique specification for making different flavors apt, but when you are inserting something else, it will just know that’s the pods or ‘unauthorized’ and ‘unrecognized’ and will not brew perfectly. The Nespresso Vertuoline does come with a few downsides, but it’s the same with the other coffee makers as well. On the other hand, the benefits are numerous, and you can adjust the flavors in any way you like. It officer one unit serve Technology which ensures that you will not waste any Grounds or beans. Indifferent of what kind of Coffee you are craving for- be it frothy milky Espresso or cappuccino, you can get it’s done perfectly right at the comfort of your home. If you are a fan of Nespresso, then you do not have to ponder Over The Other companies.